Another entry in my surprising series, Saints Cupcakes. (I say surprising because I am surprised how many posts I’ve done on this topic.) Today’s entry is from the Maple St Patissserie, on Adams and Maple. I’d have to say that Sucre still wins, based on looks alone. I have not tried any of these cupcakes I’ve written about, actually! The Patisserie is a year and a half old– I’m glad it wasn’t here when I lived a block away on Hampson and Adams. It’s hard enough to say no to food in this city. I’m here today picking up two challahs for Rosh Hashanah, which are wrapped up tight for consumption later. However, I’m enjoying a tiramusu right now. Yummy stuff folks! 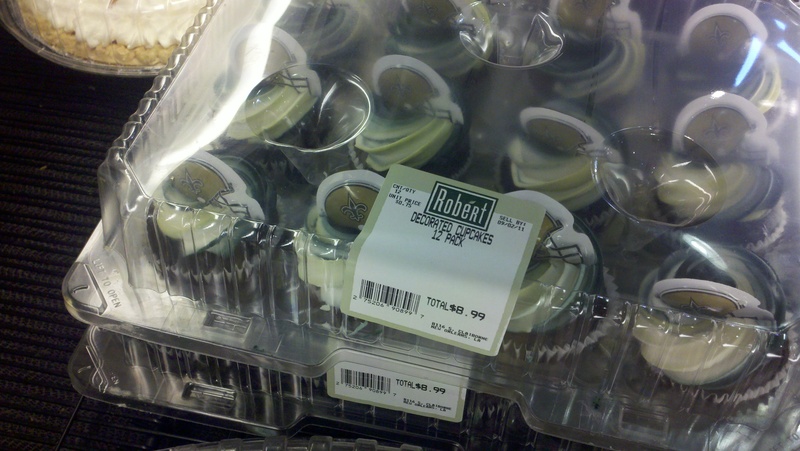 A few weeks ago I wrote about unappetizing Saints-themed cupcakes I’d seen around the city. Just yesterday I was chatting with a friend who administers social media strategy for Sucre (the tasty sweets boutique–did you guys know they have a location by the Lakeside Mall?) 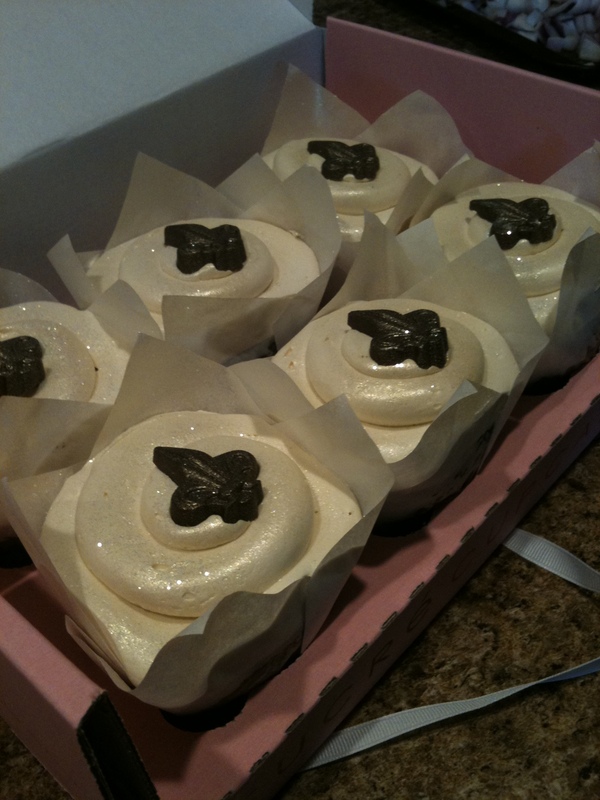 and when I mentioned the post I did about Saints cupcakes, she whipped out her phone and showed me this picture. Holy cow, Y-U-M. Not only do they look beautiful, but just looking at them makes my stomach growl. White icing with gold sprinkles, plus a chocolate fleur de lis? Sucre, you nailed it. In the original cupcakes post I referenced a friend who suggested that bakeries use white frosting with the colored sprinkles of the team. On my recent road trip I stopped at Publix in Atlanta and found these cookies. 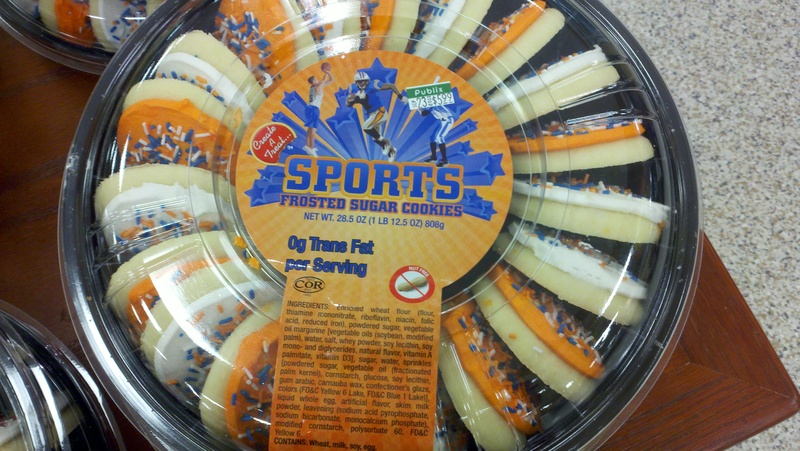 These are obviously Gator cookies, given that they are blue and orange and I was in Atlanta. There were red and black Georgia cookies, but I did not take a picture because I considered those unappetizing. So, (as we already know about this fine grocery store chain) Publix gets it done too. Today is the official start of the Saints regular season. As I’ve written before, New Orleanians are very into their Saints. This expression of love comes in many forms. Bumper stickers, tshirts, songs… and cupcakes? I never thought I’d be turned off by a baked good, but there’s something about black and gold that does not translate to vanilla frosting. At two different grocery stores I’ve photographed Saints cupcakes, but I bet there are more around the city! 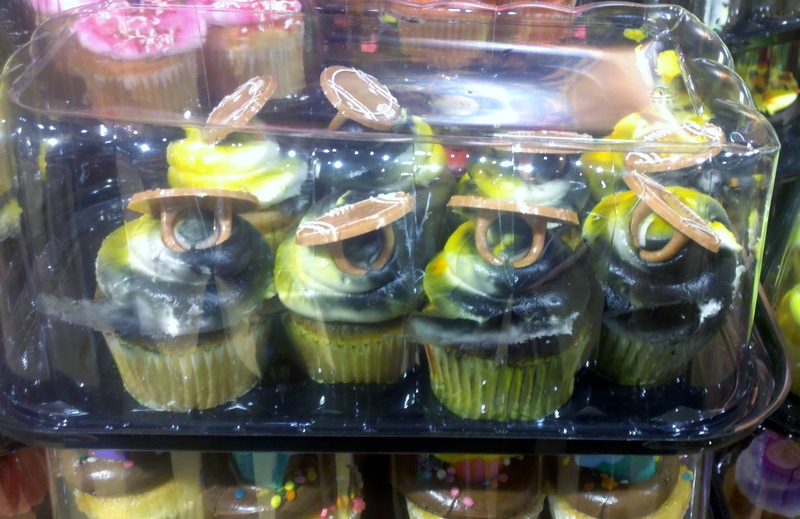 The “black” icing makes the cupcakes look dusty, and the “gold” looks more like old milk. A friend suggested that New Orleans grocery stores use vanilla frosting with black and gold sprinkles for a more appetizing treat. Black and Gold to the Superbowl. Black and Gold to the grocery store? No.